I'm not a fan of seeing big animals in small cages, which is why I liked the Emirates Park and Zoo we visited earlier this year in Abu Dhabi, the capital city of UAE. The zebra and giraffe enclosure, where this photo was taken, was a favourite with adults and kids alike. 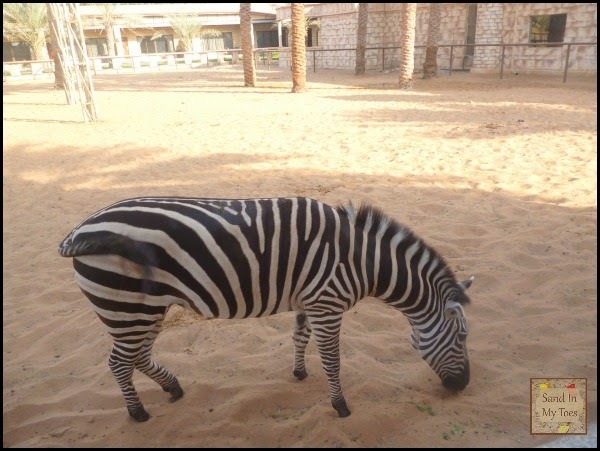 We were allowed to feed the animals here, and this is the first time I saw a zebra up close! This photo marks the last in my Alphabet Photo Series for the Alphabet Photo Project at PODcast. I loved being part of this creative project, and am a little sorry to see it end! Feel the same way about caged-animals! I do love zebras with their stripes though. Can't believe we've reached the letter z already! #alphabetphoto. I know! It's been a fun linky, hasn't it? Yes, I like the way this zoo is set up. You've got a good point there, Merlinda! Never seen a Zebra since. I'm hoping to take the kids to a zoo in Subic hopefully next year because it's a big big park where animals roam freely, or so I've been told. Hoping to see a tiger too! How wonderful to get that close, that does look like a decent sized enclosure for a zebra. Most zoos seem to be better at this now. That's true, since some animals really need to be protected.